The Cyclist returns to Hypercolour with a brand new. full length album. And as the title suggests. Sapa Inca Delirium leans heavily on South American mysticism. not just musically. but in the visual imagery that the eleven-track album paints so well across its various tempos and rhythms. From the tropical burst of mood setting opener. Go Back to the steamy and pacey percussive flow of Inhale/Exhale which features regular collaborator Tanaya Harper on vocals. The Cyclist’s fourth long player is crammed full of intriguing atmospheres and soundscapes. Antiexist. with its down-tempo rolling snare fills and ethereal Gregorian chanting segues effortlessly into A Blind Girl Drinks Ayawaska. a suitably discordant and hallucinogenic skit that ensures the album flows into the more rhythmic cuts like Skateboarding In The Jungle and Mirrors (the second album cut to feature Harper on vocals). Even the traditional jazzier vibes of When We All Break Down featuring Joni are kept rugged and boisterous. with heavyweight bending bass. choppy breakbeats and FX’d ambience amongst the smooth jazzy chords and sweet vocal delivery. 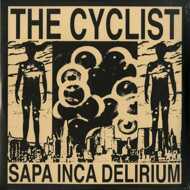 Sapa Inca Delirium is one of those albums that will reward on repeat listen. such is the diversity of style on show here. and the detailed and wide eyed curiosity offered up across the long players fifty three minutes.